Keno is a gambling game very similar to bingo or lotto. While it was originally played in China, keno made its way to the US around the mid-19th century and became very popular. Today, you can play keno in almost every US state that allows this type of gambling. You can choose to purchase a ticket at your local keno retailer, or you can find the game in a casino, either land-based or online. 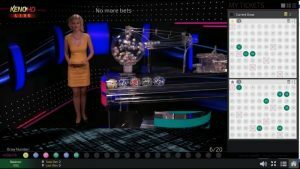 In this article, we will be talking about the most common numbers in Keno, the mathematical chances of winning in a keno game, and the numbers people usually choose. Let’s start! Which Numbers Do People Usually Choose when Playing Keno? Everybody has their own lucky numbers. Whether it’s an important date in your life, like a birthday or an anniversary, or just some numbers that you consider to be your lucky ones, people usually have a lot of superstitions when playing keno. This works both ways, as players also often avoid specific numbers. The numbers 6, 13, and 66 are generally considered bad luck, so people stay away from those in most cases. But in China, for example, people often choose the number 6 because it represents wealth, number 8 that is also connected to wealth and prosperity, and number 9 that stands for the Chinese emperor. In the US, number 7 is considered a lucky one, and because keno numbers go up to 80, people also often pick 77. But do the numbers that you choose actually matter? Are there numbers that get drawn more frequently than others? By looking at some of the previous keno draws, you can see which numbers get drawn more than others. Some winning numbers that are repeated are considered hot, while the ones that have a lower frequency of occurrence are referred to as cold. While you can base your guesses on the frequency of numbers in previous draws, nothing guarantees you a win. The fact that some numbers get drawn more frequently than others is the product of pure randomness. While many keno players believe in the hot/cold strategy, that is rarely going to be beneficial to them. This is also referred to as the Gambler’s Fallacy. People tend to believe that if a certain number comes up more frequently that it’s more likely to come up again, when in reality, all numbers have an equal chance to get drawn despite of the previous draws. Nevertheless, Keno has 80 numbers, and their draws are not always evenly distributed. One website from New Zealand calculated that the number 27 is the most common Keno number in that country, being drawn 25.74% of the time. Close behind is number 12 with 25.65%. The number 17 seems to be rarest, as it only showed up 23.70% of the time, or 343 times less than the “hot” 27. In the last 14 years of Keno draws in Hungary, statistics show that the most common pairs are 47 and 66. The number 47 also shows 9 more times in combination with other numbers in the top 20 pairs list. Interestingly enough, 1 and 2 are the second most frequent pair in Keno draws in Hungary. Keno stats for Washington Lottery in the US suggest that the numbers 75, 29, 53, 65, and 42 are the most common ones (at the time of this post). So, as you see, there’s not much of a rule when it comes to Keno numbers. Some are more frequent than others, sure, but not by that much. The chances of you guessing one number out of 80 are 0.25%, which makes keno one of the most difficult gambling games to win. Depending on how and under which rules you play the game, the casino edge for keno can be between 40% and a massive 70%. If you’re playing keno through the state lottery, the numbers will get picked from a rotating drum. Keno balls are all the same, which eliminates any chances that some numbers have a better probability to get drawn than others. If you’re playing the game in an online casino, instead of the drum, the game will use a random number generator for the draws. That is a computer-based system that doesn’t use any recognizable patterns for drawing numbers. If a game is RNG-certified, that guarantees that the outcomes are fair to all players. 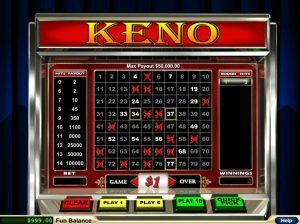 If you’re hoping for the highest payout in keno, which is guessing 10 out of 10 numbers, you should know that the chances for that happening are one in 10 million, making keno one of the most unlikely gambling games in which you could win a jackpot. The calculations further show that the best chance of winning money back in keno is by playing the 6-spot game where the house edge is around 43%. On the other hand, playing the 10-spot game will increase the casino edge to 70%, making it the most difficult type of keno. Keno is based entirely on luck, as you can’t predict which numbers get drawn, although that may be contrary to your beliefs and superstitions. Keno doesn’t require any skills whatsoever. Even if you played the game for years and never won, all players will have the same chances of winning as you with every new draw. Don’t play keno if you’re looking to win money regularly, as there’s no such thing as a “hot streak” in this game. To be as safe as possible, play the 6-spot game since it mathematically has the highest chance of paying out. Other than that — good luck!